My Rain Drop birdhouse was recently featured in the Globe and Mail! Follow THIS link to read the article. It’s springtime which can only mean one thing, a whole bunch of new stockists have come on board. It’s always great to expand my reach of retail space, and while I’ve covered many parts of Ontario, I still need to find a few Western shops, contact me if you’re in Western Canada and interested in stocking my products, always keen to add more shops! Here are a few of my latest shops, checkout the links, or even better, swing by their store if they’re close by! 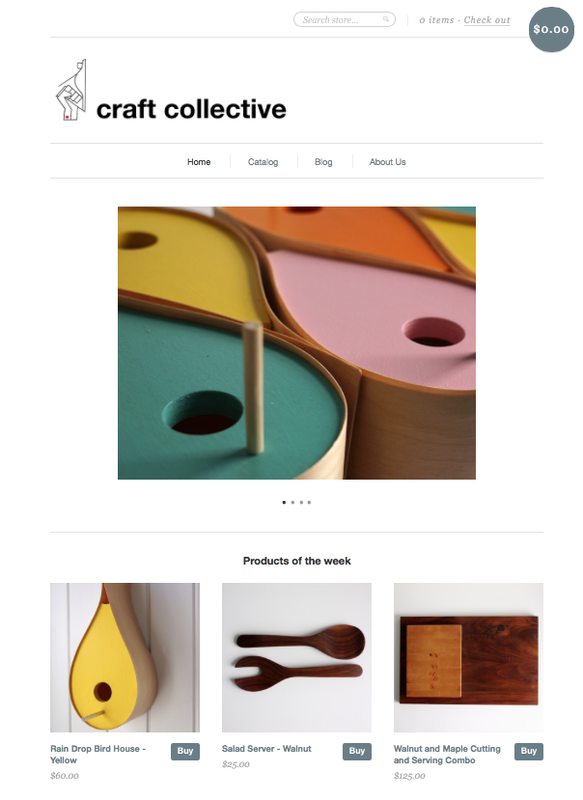 For a full list of stockists and addresses, please visit my stockists page. 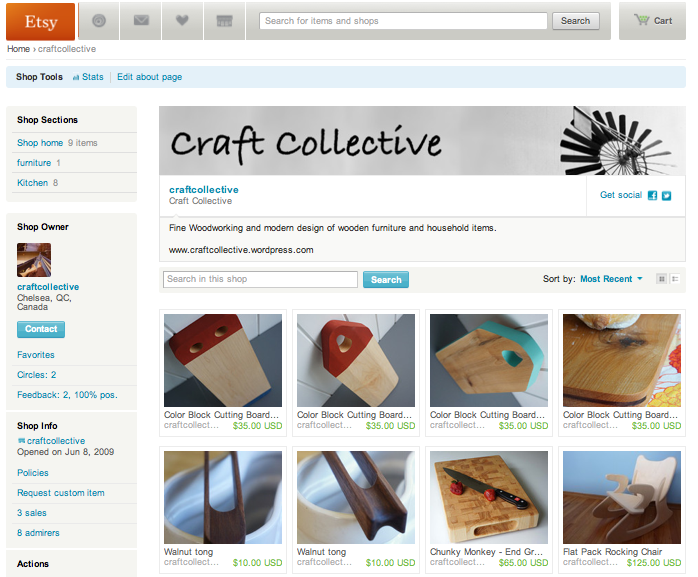 Or go to Craftcollective.ca to shop online. I was finishing up a set of kitchen drawers this past week for a client. While they aren’t a style I would design myself, they were a big improvement structurally on what they had and it would match the rest of their cabinets in both grain and colour. This is no easy feat as the red oak in their kitchen had darkened with age, so while the rest of the cabinets have a clear varnish, these drawers needed staining to match the rest. The drawer boxes were made from baltic birch and I was using some heavy duty glides. I was proud of what I had made and couldn’t help but think how much of an improvement over their old drawers this would be. Then my mind wandered to our own kitchen. Some drawers are had to open, some don’t open at all. The construction is pretty horrible and they get worse every week. You see, while I make furniture, good furniture, for all sorts of people, the one person I don’t make it for is myself. While I’ve made several beds, our mattress sits on the floor. Do I make tables? You bet! But we use one my parents got rid of 30 years ago. Desks? We have a door propped up on a book case. The problem is at the end of the day, clients pay me to make furniture, I don’t pay myself to make it. So I’m far better off building furniture for other people than I am for myself, at least financially. The one exception is my daughter. I’ll build her anything, it might take a bit longer to do, but she has some of the nicest furniture in our house. Now while this is good financial sense, it does lead to an unattractive living space (some would say college dorm style). And some days you walk into your room, see the mattress on the floor, and think, why don’t I have a nice bed? So my new goals are to own furniture as nice as I make. This means I don’t have to make all of it, but if I buy, it needs to be as good if not better than I can make it. I think this will give me great practice in trying out new designs on myself, and it will help pad my portfolio to show others what I am capable of. I was interviewed a few weeks back by a journalist from La Presse, I’m always a bit reluctant when approached by media as I find my words never seem to come out the way I hope. I tried to convince the journalist to let me answer questions via email but she was insistent on a phone interview. Well, my fears were not warranted at all. Last Saturday the article was published in the print and tablet edition of La Presse and it’s without a doubt the best article I’ve ever had written about me. I can’t get over how well it was written, it’s exactly what I would hope it to be! I’ve since had a huge spike in traffic on both my Etsy Store and my online store, especially from the Quebec region of Canada (where I live) which is great to get so much local recognition. The CNC arrived this week, and am I ever glad I had it shipped. It was very heavy, very awkward to lift, and the drive alone would have taken 8 hours each way. After unpacking there was a bit of damage as it hadn’t been crated so a few little issues, most likely due to us loading it off the truck. Luckily two switches were easily reattached and a new drag train is on order for minimal cost. Honestly I didn’t see the machine in person so maybe these were issues before, who knows. After a day of set up, I was pretty surprised how fast it was up and running. The drive computer has Cut 2D on it, so I’ve been using that for now, although I plan to get Vectric Pro when funds allow. I now need to build a table for it to get it up off the floor. I’ll make something with casters on it so I can move it around if need be since it’s currently blocking the loading door of my shop. The door isn’t used that much but it may in the future so having the ability to move a 330+ lb. machine would be nice. Lots of future plans now as I begin to learn all the potential of this machine. I’ve been in love with CNC routers ever since I first heard about them over 10 years ago now. I’m generally fairly impulsive, but for some reason this time I waited, and waited, and waited. Over the years I bought a “how to build your own CNC” book, I’ve read countless web pages, and almost bought an X-carve from inventables last year. But as the years went by my interest turned from hobby to business, and so my needs changed. I have very little free time, and I can’t justify spending work hours to build a machine when I need to be making things to make money. I know you can argue that building this machine would help me make money later on, but I’m not convinced the savings would work out in the end. Another issue is I’m pretty impatient, and I might not follow every step, or complete each operation, and chances are the machine might not be perfect, and that will lead to less than perfect cutting, which will drive me crazy. The Inventables option seemed better, but not so sure if it would put up with commercial work. So last week I figured I had enough money in the business account, and there was an ok deal on a CNC. After several days of emails I had just about bought the machine but started to get a funny feeling from the private seller, and was getting frustrated with his communications, so called it off. The next day I found another machine, slightly different size, slightly more money, but still a decent deal. Then today looking at old Kijiji listings, I saw a CNC for sale but I was sure it was long gone. I contacted the owner in the off chance it was still for sale, and it was! The price was better than the other two machines, and while a bit further from me, I agreed to purchase it. Due to the distance from me, it’d take me 2 days to go there and back to get it, plus cost me a rental van, gas, food, accommodation, etc. So I hired a shipping company, that way it gets to my door and I can spend those days catching up on projects that have fallen behind a bit lately. We’ve had so much snow this week that I’ve spent more time shovelling that woodworking it seems. Hopefully I’ll have the machine by the end of next week, then I have to figure out how to use it! Not much more to write really. Some weeks the projects fly off the list and get done at amazing speeds, other weeks I just spin my wheels. It didn’t help that there were two PD days this week, but a faulty electrical socket and a broken coffee maker in the bakery certainly didn’t help move things along either. In the end I managed to finish off some iPad stands and some charcuterie boards, but I had hoped to be much further ahead in prep for One of a Kind at the end of next month. Came close to buying a used CNC machine but I took too long to reply and missed out on a decent deal. I’m beginning to realize more and more how a CNC could help me out, only a matter of time before I buy one. Next week will be better, not sure how, but they will.